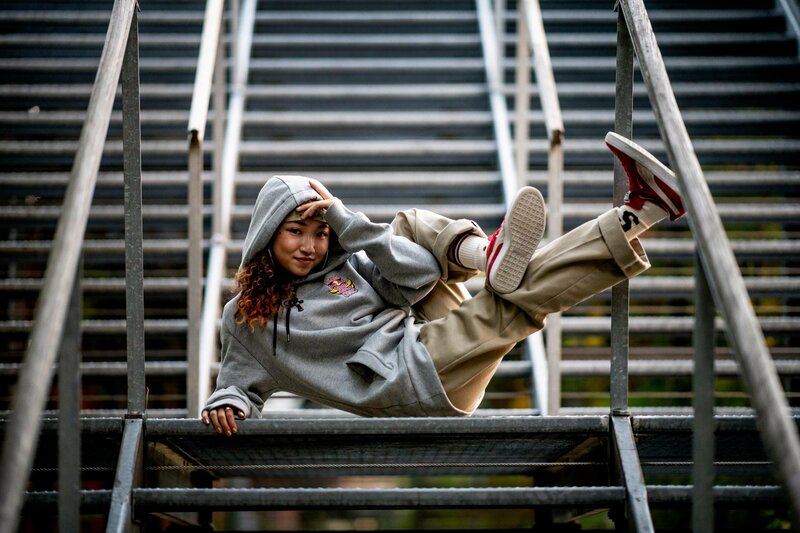 Japan's B-Girl Ami became the first B-Girl world champion of Red Bull BC One in Zurich on Saturday, September 29, 2018, surpassing 15 other female competitors from around the world in the process. Each B-Girl came to win and delivered fierce battle after battle over the three-day event, but nobody proved more ready to take home the title then Ami. Combining razor-sharp footwork and explosive power moves, B-Girl Ami defeated Ukraine B-Girl Kate, Russian B-Girl Kastet, Japanese B-Girl Narumi (one of the most iconic B-Girl legends in the game) and B-Girl San Andrea, of France. Since emerging on to the scene in 2009, Ami has made a huge impact. Taught by some of the best B-Boys to come out of Japan like Katsu-One and Taisuke, and as the little sister of B-Girl Ayu, it seems she was destined to be a champion. One look at the lengthy list of flash titles B-Girl Ami holds down is proof enough. Winning the 2017 Silverback Open solo B-Girl competition, the 2017 Undisputed World B-Boy series solo B-Girl competition, the 2016 Battle of the Year 2v2 B-Girl competition with her sister, B-Girl Ayu, and now making history and winning on a stage where it's always been her dream to battle. We caught up with B-Girl Ami minutes after stepping off stage to find out how it all went down inside the battle and what it means to be taking the belt back to Japan as the B-Girl world champion. First of all, congratulations! How does it feel to win? Winning, I feel so proud to not only be representing my country but also myself. But at the same time I was not only focusing on winning the belt and making history, but having fun. I feel like I became the champion while also taking in the vibes of the main stage and I feel so happy with that. What aspect of your training did you focus on the most in the run-up to tonight's world final? I've been training mostly by myself, maybe three or four hours per day. The toughest for me was stamina and I was using my stopwatch a lot so that my stamina doesn't go down. That's been the biggest thing I've worked on. Practising has always been my lifestyle, but after I heard the news that I would compete in the Red Bull BC One I started practising that much harder. Usually I practise new moves, but before the final I just focused on being cleaner. You won four battles in Zurich in three days. Looking back, what was your toughest battle overall? The last round, against B-Girl Kate in the qualifier for the top 16. That for sure was the hardest. What were you thinking during the battle against San Andrea? Was it all a blur? I remember it clearly but I wasn't thinking of a lot, just trying to focus on winning the battle. What did you think helped you the most to take the title? Practice! So much practice and so much help from my family, my crew mates, and my teacher. What's the biggest thing that drives you to be a B-Girl? Before I wanted to be a B-Girl because of the moves. If I could do a new move I'd get so excited, but I feel like now with breaking I can go so many places. I can meet so many people, and that's so fun and amazing for me. I train harder just for that and so that I can do that again and again. What B-Girl or B-Boy do you look up to? My biggest inspiration has been my teacher, B-Boy Katsu One. What are you going to do to celebrate? What does being in the Red Bull BC One World Final mean to you? For me, Red Bull BC One is a dream stage. I've always watched all the World Finals and been so interested in it. To have the chance to stand on that same stage now, that's really special for me. What advice would you give to B-Girls who might want to compete next year? Of course, practise a lot but also enjoy it as much as possible. Take in the whole experience.